The primary purpose of our Small Group ministry is to provide a permanent and consistent structure that is conducive for creating and cultivating relationships. There are six additional purposes: they are discipleship, evangelism, leadership development, ministry (via spiritual gifts and assimilation. Discipleship is process of becoming more Christ-like. Paul wrote specifically about this in his letter to the Romans. When we refer to discipleship we are also talking about spiritual development. Small groups provide for discipleship in ways that our large (worship assembly) and medium (bible classes) sized groups are less effective. The reason is along the same lines that we have discussed with group dynamics. In the large group we are presented with information about how God wants us to live and encouraged to go and live that way. In the bible classes we have the opportunity to discuss what it looks like to live out the scriptures, but we rarely move past this level into talking about how we are personally succeeding or struggling to do so. 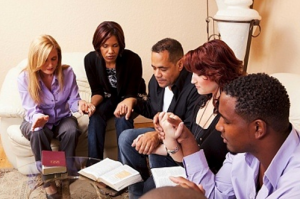 In small groups we will have the opportunity to share in these more personal discussions. Evangelism is directly impacted by small groups in that they provide a non-threatening and informal environment where non-Christians can interact and develop relationships with Christians. Every relationship increases the opportunity the person to be converted to Christ. Additionally, people who have little to no church background are (for whatever the reason) often reticent to accept an invitation to come to a worship service. In those instances, an invitation to join a group of friends is much more likely. Leaders are not developed without having the opportunity lead. And opportunities to lead rarely present themselves without intentionality. Leaders are raised up through small groups as they are given more opportunities through practical experience. There are different kinds of spiritual gifts, but the same Spirit is the source of them all. 5 There are different kinds of service, but we serve the same Lord. 6 God works in different ways, but it is the same God who does the work in all of us. A spiritual gift is given to each of us so we can help each other. Some gifts are public in nature. For example, the gifts of teaching, preaching or worship leading all have natural avenues to be utilized. However, that is not the case for all the gifts. There are others that can easily go underutilized if we are not intentional about creating opportunities. The small group structure, for reasons already discussed, provide the opportunity for relational gifts to be manifested and appreciated. The final purpose for our Small Group ministry is to provide a means to assimilate visitors and new members into the family (by helping them to develop relationships with as many people as possible). This has also been referred to as “closing the back door”. There are few things more frustrating of investing yourself so much into sharing your faith with a friend, praying for them, studying the Bible with them, converting them to Jesus Christ and then watching them slowly fall away because they were never able to get connected and by making friends with people in the church. A small group is a natural on-ramp that will connect visitors and new converts alike with the members of the church and provide the opportunity to begin creating and cultivating relationships. By now you may have begun to realize why creating and cultivating relationships is the primary purpose of the Small Groups ministry and all these other purposes (though important) are secondary. Each one of these other five purposes is a positive outcome of creating and cultivating strong relationships. And beyond that, each of these secondary purposes are interconnected and feed off of one another.